The month of April had just started and the PC gaming world had been busy with so many launch trailers that perhaps not everybody was able to cope. We did, however, make sure that you won’t miss the most notable ones and listed them below for you. This trailer that was shared by Focus Home Interactive featured the game’s Dynamic swarm system. It’s just a quick video but you get to see how these Zeke swarms behave and how scary it is once they are able to lock on you. Since they work as one unit, you get to see how they climb walls as well as go through obstacles. Gearbox Software had previously promised new information about Borderlands 3 and here it is, in the form of a trailer. We get a sneak-peak at the new Vault Hunters, the twin antagonists plus their minions. Also, the game’s release date has been confirmed which is on September 13 as well as that the game is a timed-exclusive on the Epic Games store. A new Blackout map is coming to Call of Duty Black Ops 4 and it is called Alcatraz. This is a smaller map that will allow players to respawn up to 5 times. Also, you can expect a lot of mixed up Blackout gameplay in this map. Players will come from any random portal and will be able to reach any part of the map when dropping. Zombies are also seen in the game’s future. This is the latest trailer that we were able to get from the arcade kart racing on PC. It does show the many improvements available in the game as compared to what the game has when it was first announced. That little extra time they got for delaying the game did work well. Rage 2 has previously announced that they will be getting cheat codes one of which was the Tim Kizrow commentary from NBA Jam. This time around, another cheat code has been shared and it is a commentary provided by Danny Dyer about the British gentlemen. The Division 2’s Year 1 update is called Invasion and this will bring in the Black Tusk’s stronghold, Tidal Basin and Operation Dark Hours which is the game’s first 8-player raid. The update will be made available in three parts. The last one will unlock the fourth specialization and its signature weapon. This game actually launched this week on Steam and it is a tactical role-playing card game based on the Dragon Ball franchise. If you think “card game” and “Dragon Ball” doesn’t fit together, well, take a look at the trailer to find out. 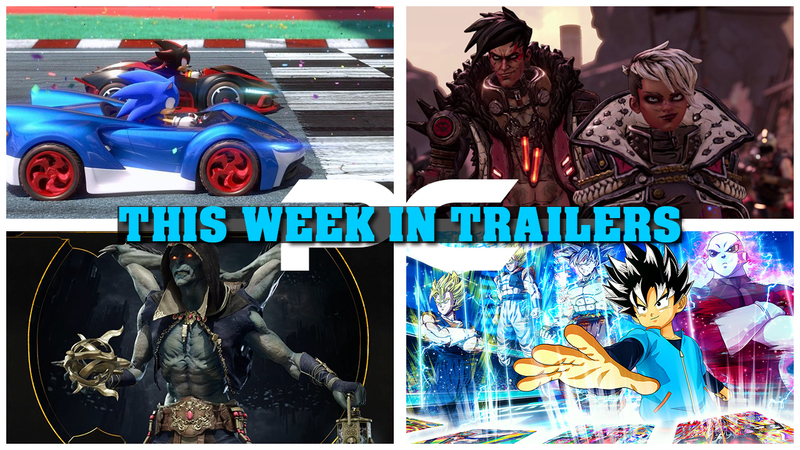 And that has been this week’s trailers. Hope you enjoyed watching! We’ll be back soon for more.